Premium Recycled Rotary Trimmer is made from 100 percent recycled materials. Trims up to 36 sheets of standard 20 lb. bond paper. Rotary trimmer also cuts cardstock, plastic film, photos and more. Trimmer includes handy built-in paper guide, carrying handle, spare cutting mat, and straight and perforating blades. 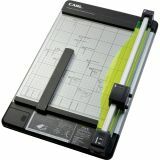 CARL Heavy-Duty 12" Paper Cutter - 12" Rotary Trimmer is an ideal choice for even the most demanding cutting project. This Rotary Trimmer also includes a handy storage area that houses an extra straight and perforating blade as well as an additional cutting mat. Excludes blade and cutting mats.